Which Stress Relief Technique Is Best For Your Zodiac Sign? 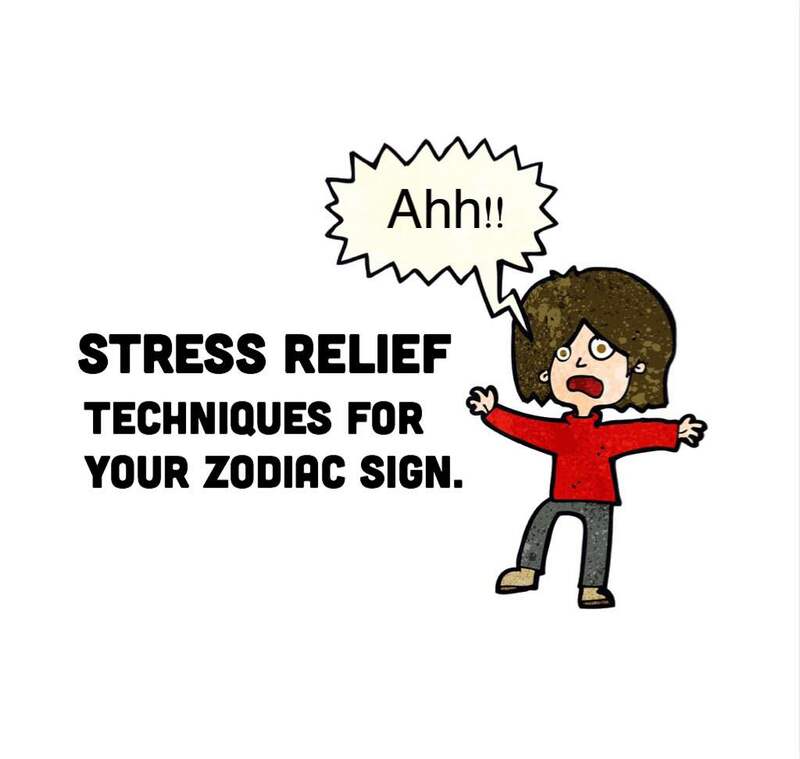 Each zodiac sign has different triggers for what stresses them out, and also different stress relief tactics they use. Most people inevitably feel stressed from time to time, due to anything from job demands to financial worries to health problems, or other issues we all deal with in this modern world. Unless you’re somehow reading this from another planet in the galaxy (if so, please tell us how to get there), you have probably felt burdened by some sort of stress or anxiety at some point on your spiritual journey here. However, what stresses a Cancer out will differ greatly from what stresses a Sagittarius out. All of us could use some sort of technique for coping with stressors, and some insight into what makes us the most frazzled can open the door for us to start dealing with the stress in a healthy way. Rams pack so much into their day, and rarely slow down to catch a breather or just notice the little things in life. Aries can get burned out if they don’t take time to relax and rejuvenate from a very busy school or workweek. You have so much energy and use that to carry you through the week, but when your energy dwindles, this can leave you feeling like you’ve let yourself and others down. Aries want to charge ahead full force at everything, but they need to remember to walk before they run sometimes. Take at least one day off a week to do absolutely nothing; you can replenish your energy and also have a chance to enjoy life at a slower pace. A Taurus has a strong work ethic, and wants to get their work done right the first time around. They take failure pretty hard, and rather than seeing it as an opportunity to grow, they view it as incompetence on their part. A Taurus also tiptoes around people’s feelings at times, not wanting to hurt others or get into any disagreements. Powerful stress relief techniques for this sign include going a bit easier on yourself, and not fixating on every little thing. Also, remember that you have no control over how other people will react to your words; you can only have ownership of how you handle a situation. Geminis are a very dynamic and complex sign, and can change their mind on a whim. They never stop thinking, which can lead to stress if they overcomplicate a situation. Geminis thrive on good conversations and generally have a bubbly, upbeat attitude. They just want to have fun in life, and want to be around others who have this same kind of energy. For a Gemini, their own mind can stress them out, so keeping active is a surefire way to kick stress to the curb. Geminis are a highly social sign, so any sort of activity where they can be around people is a preferable one to get involved in. As a Cancer myself, I can attest to the fact that Cancers are often misunderstood and get hurt easily, leading them to retreat into their hard shell instead of tell others how they’re feeling. Cancers need to feel secure, and when they don’t, their stress builds until their shell finally cracks, exposing their true emotions. Cancers, instead of relying on others to nurse your feelings and make you feel safe, give that security to yourself. Practice deep meditation and do things that make you feel the most protected. Also, give your motherly energy to other people – volunteer at a nursing home, help someone out to the car with their groceries, or anything that will get your mind off your emotions and onto other people. Leos want to be in control of everything in their lives, and can’t stand when they have no say in how things will go. A Leo loves the spotlight, and must be the leader in everything they take part in, whether that’s a work project, a business deal, or anything else that requires leadership. Leos need to learn how to let go and live in the moment, instead of trying to control every aspect of their lives. A fiery Leo thrives on respect and adoration from others, but make sure you Leos give that same attention to yourself first instead of expecting it from other people. Virgos also think too much, like Geminis. Virgos have a very logical thinking process, and hardly do anything in life without thinking every little aspect through to the fullest. Without making lists to organize their thoughts, Virgos can easily let stress get the best of them. They also can be very critical of themselves and others, and enjoy a profession that requires paying attention to minute details. They are problem-solvers, and will help others solve any issues they’re having in life. However, getting to the bottom of their own problems is a difficult task. Virgos would do well to put their thoughts and ideas on paper, and also not scrutinize themselves and others so much. Libras get very stressed out when people treat them unfairly. They hate confrontation, and will spend hours deciding what to say to someone who’s hurt them, and if they should even bring up the issue or not. Libras are the sign of balance, after all, and don’t like anything to go unresolved, making their scales tip too far in one direction. Libras are wonderful at creating harmony, and have an airy sense about them that makes others feel comfortable and at peace. You treat others well, but this isn’t always reciprocated. If something bothers you, make sure to confront others, but keep it short, sweet, and to the point. Your peaceful nature will keep any confrontation from getting out of control, anyway. Scorpios, like Cancers, are a sensitive sign that hide their emotions beneath their hard scorpion shell. They enjoy having their privacy, and in general don’t like being around very noisy or inconsiderate people. Scorpios also tend to hold grudges, and like to get revenge on others who have done them wrong. Scorpios, make sure you speak up if any boundaries have been crossed, and don’t allow others actions and choices to get under your skin too much. Sagittarius’ need constant movement in order to feel at peace. They don’t like being told what to do, and feel stressed when they must follow rules or adhere to boundaries set by others. They are very impatient, impulsive, and sporadic, and don’t like situations where they must act “proper” or behave according to other people’s standards. People born under the sun sign of Sagittarius must make sure they stay active and get lots of time outdoors in order to not feel constrained. Capricorns have high expectations for themselves. They can easily overwork themselves if they don’t pay attention to their own needs, and don’t usually make a lot of time to unwind. They like telling others what to do, and often meddle in other people’s lives. They, like Leos, must have everything under control. However, life doesn’t always go according to plan, so Capricorns need to remember to relax and let life happen sometimes. Also, don’t take work too seriously; make enough time for play, too. Aquarius are very witty, inventive, and adventurous people. They live a no strings attached kind of life, and any sort of commitment or attempt to reign them in will have them running for the hills. Aquarius are full of excitement, and will always show you a good time no matter what you’re doing. However, they can also be a bit detached emotionally, and let their stubborn streak get in the way of listening to other’s opinions. They don’t like to admit when they’re wrong, and tend to think in an objective manner, not letting their emotions get in the way. Aquarius need to remember that life doesn’t always go their way, and to let it unfold as it should. Pisces are very secretive, creative people, and don’t like to be in the spotlight. Feeling exposed is a major stress trigger for a Pisces, and they can even get sick due to negative energy from others invading their space. They prefer quiet atmospheres, and shy away from loud people and situations. Pisces need to make enough time for themselves to recuperate from putting themselves out there, and also work on increasing their vibration in order to shield themselves from any negative energy.